Approximately seven months after funding my first deal, I learned of a situation. 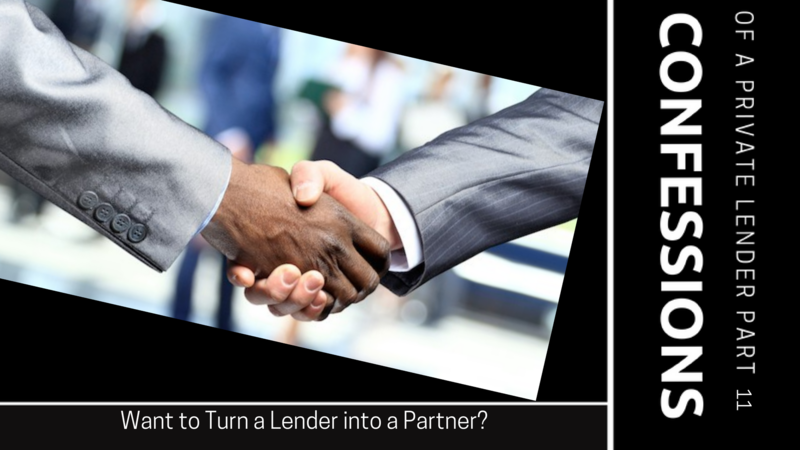 An investor had a closing scheduled on a rental home purchase in a couple days and thought he had a private lender lined up. When he made contact, the day prior to the scheduled closing, he learned that the potential lender had not yet even looked at the documents and was anything but certain to fund. The investor had an urgent situation. If he couldn’t close, he would lose his earnest money and the deal. On a friend’s advice he posted to facebook. I did not know the poster well but we were more than just facebook friends. We both previously invested in a real estate project organized by a mutual friend (the one who advised this investor to post on facebook). I saw his post about five minutes after he posted and phoned him. After a brief conversation I was able to determine that I had the required funds available and was comfortable with his business model. The borrower intended to hold this home long term and operate it as a rental property. The home was in an area that I had some familiarity with—it was easy for me to determine its value. He had approached a bank which gave preliminary approval to refinance the property in approximately 6 months—this was the first exit plan. The investor was putting 20% down from his own funds. He had not been operating rentals long but the down payment went a long way toward convincing me that he was committed. The kicker…our mutual friend had already agreed to funding approximately 12% of the deal. I didn’t have to call him to see what he thought about the deal and/or the borrower—he had already voted with his checkbook. The request: fund ~70% of the purchase price on a nice rental in a solid neighborhood, being purchased at a good price. Monthly payments by the borrower were easily covered by rent receipts. In 6 months he was going to cash me out. If a catastrophe occurred and he couldn’t make the payments I would get the home back I suspect this partner would not even force me to foreclose if he got into dire straits. I would rent it myself. The other lender on this deal would probably manage the home since it is near some that he owns already. As I spoke about in previous blogs (Part 2, Part 6 and Part 9) , the worst case scenario for me in a situation like this, is that the borrower would pay as agreed. I would expect to earn more if he defaulted. From the beginning, this borrower proved he was not just a borrower and that he thought of me as a trusted partner. He gave me every reason to return his respect. The first monthly payment was made one week before it was due. The borrower knew there was a delay in receiving payments into my self-directed IRA. He wanted to make sure that the payment arrived on time. The borrower e-mailed me a copy of the check, the payment coupon and the tracking number for the mailing. I never asked him to do this. Want to make an impression on a business partner? It’s easy. Exceed their expectations. The worst case scenario played out for this deal. The borrower made all the payments before they were due, and refinanced a little more than six months later. Three months into this deal, my new partner found another home to add to his rental portfolio. I funded that one on similar terms, except this time I did not require him to make a down payment. Since that time, I have funded two more homes for this partner and participated in other deals with him. I welcome the opportunity to work with him again. In this case, posting to facebook worked, but that is not a strategy I recommend for gaining private funding. The post was strong. The investor was not begging for help—he was offering an opportunity. I responded because I had an existing relationship with the investor. It is rare that I, or most lenders I know, would respond favorably to such a post. If this series continues, I will explain more of my thoughts regarding securing private funding and the dangers of relying on social media to find funding. I was pleased to be invited to contribute to this redesigned site. Interested in details of other deals or in other topics, please let me know and I may write a post on it. If I touch on a subject that interests you and that you would like me to expand on, or if you would like to suggest other topics, please leave a comment and let me know. If you think I have missed the mark completely, go ahead and tell me that also. You won’t make me cry and it may turn into an interesting discussion. Please join the email list, follow on facebook, and add on twitter.